Antigone was performed at Eltham College Performance Centre on November 9th and 10th, 2007. 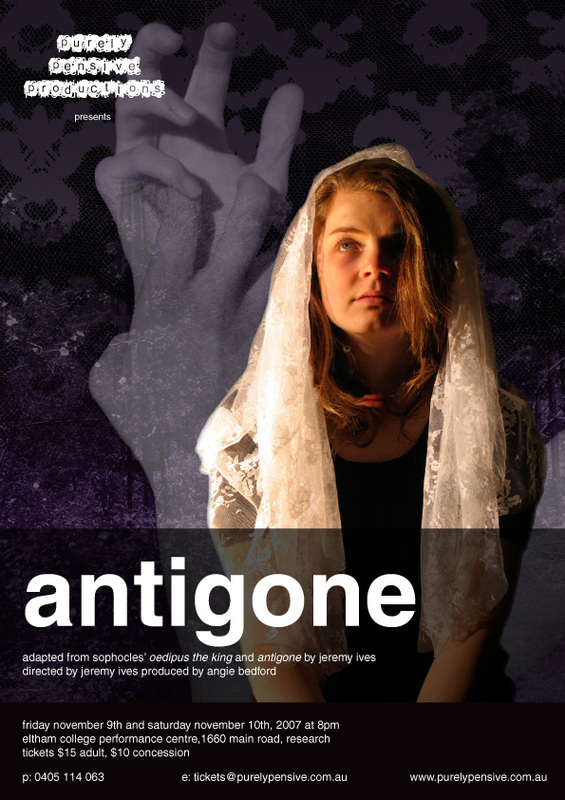 Antigone is an adaptation of Sophocles' Antigone and Oedipus the King by Jeremy Ives. Antigone tells the story of Antigone Labdacus, the youngest daughter of King Oedipus and Queen Jocasta. Antigone is very much a person for others and enjoys the safety blanket of her family. When we first meet Antigone, her life could not be better. She is engaged to Haemon Argives who she is very much in love with and she is planning her wedding which she is making a celebration of the people of Thebes. Antigone is blissfully unaware of the impeding doom her family is about to endure. King Oedipus has been warned of a premonition his friend Eurydice has seen that his family is in trouble. Little does Oedipus know that it is his wife’s actions which will be the undoing of his family. A power struggle erupts over the throne between Antigone’s two older brothers, Polynices who wants to rule Thebes the way his father Oedipus has and Eteocles who has sided with influential businessman Creon in attempt to be more powerful and successful than his father. In a bloody war both brothers are slain and the new King Creon declares that Eteocles is entitled to full honours including a state funeral, while Polynices must lie slain in the fields to be eaten by wild dogs and vultures. Upon hearing the orders, Antigone decides that she must do everything in her power to make sure both her brothers are given proper burials although it may mean her death. This is the tale of one woman against society.